Unfortunately, we still don’t have a working engine, after eighteen months without so much as a hiccup, the dirty fuel has created a problem that no one can identify. Currently, after a week of work, the thinking is that it has to be the injector pump but when running it in isolation this afternoon everything seems fine. Our planned departure for Auckland on Monday is now delayed, we have a weekend of engine testing to do and the costs are mounting up. On the upside Opua is rather nice, the locals have all been friendly and extremely helpful, more of our friends sail in each day and we finally seem to be acclimatising to the cooler weather. Isolating each pump and filter to try and identify the problem. Last Monday, unaware of the engine problems yet to come, we borrowed a car from the Island Cruising Club and ventured out for a few hours. The countryside around the Bay of Islands is like a gentle Devon, slightly rounder hills, smaller cliffs and being in the lea of the weather, has calmer sea. The countryside is very green and the vegetation subtropical, the air is full of the scent from the dominating pine trees. Our destination was Kerikeri, a town 30km from Opua, where “the shops are a bit bigger”. Well, as it turned out, not much bigger but we did find a nice butchers, a small chocolate factory that sold delicious handmade truffles and had a great lunch at the Ake Ake vineyard, where we stocked up on wine. 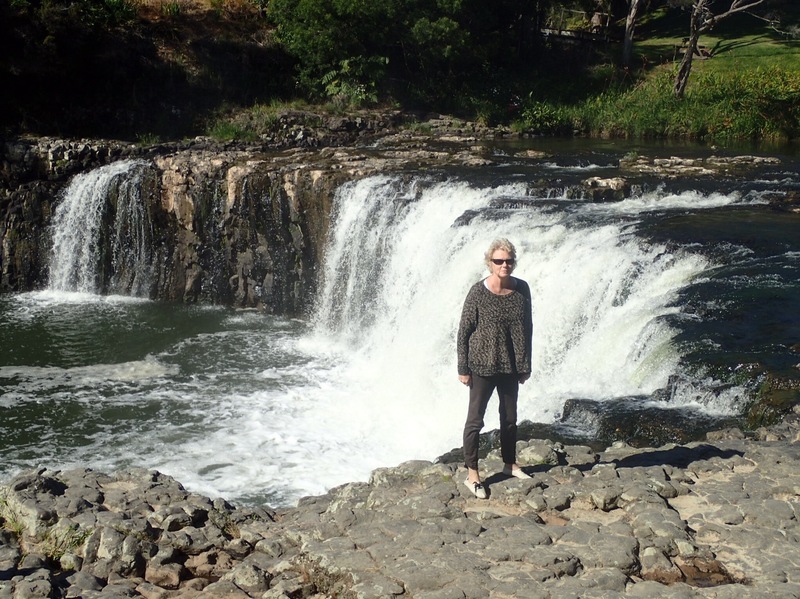 On the way to Kerikeri we stopped at the Haruru Falls, a small waterfall just outside Paihia and our first New Zealand attraction, a pretty spot but with a cool wind whipping up the valley it was too cold to stay for more than a few clicks of the camera. So far everywhere has been signposted very clearly, the sights are all accurately marked on the maps and the many walks, or tramps as they are called here, are graded from easy to expert with information on duration, suggested experience required, track conditions that will be encountered and even type of footwear needed. Rick was pleased to discover as we entered the Haruru Falls car park, that this track was classed as easy, it was in fact very easy, a gentle five minutes stroll, flip flops would have been adequate. Our first impressions are that New Zealand may be rather prescriptive and full of rules. The marina has a long list of do’s and don’ts, as does the harbour, the roads have different speed limits around every bend and even the sights are full of instructions. It might be just that we are so use to the freedom we have had over the past year, but we are feeling a bit controlled. Back onboard Raya we have been busy using our time to get as much done as possible while we are stuck in Opua. 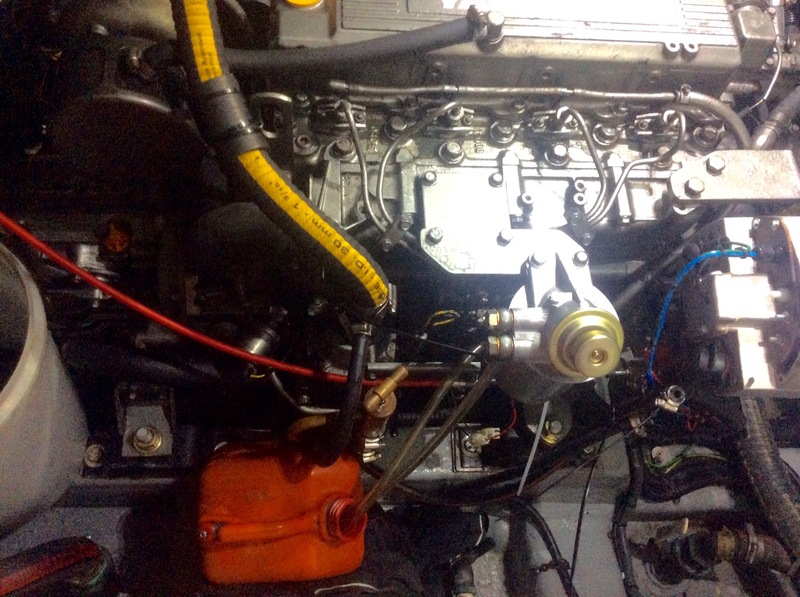 The sails are back on looking clean and very smart, Rick has replaced the shore power sockets on the stern, we have a new altenator and while working on the engine it has been completely serviced and new engine mounts put in place. With the boat full of oily men, diesel fumes and noise, I have spent my time mostly cleaning or trying to find a small calm space to catch up on admin and when possible doing some trip plannig, guide books, maps and cruising guides abound. Rick has been tempering his frustration at the undiagnosed engine problem with the amount he has been learning head deep in the engine room, up to his elbows in diesel. If only with his new found knowledge he could work out why the damm thing keeps stopping! I am not familiar with that particular engine but it is always worth checking that the whatsit is correctly engaged in the doofer so that the diphthong differential is able to feed diesel to the reverse bias spurgalator In precise synchronism with the orbit of the moon. Ps. We’re closed over the entire Christmas period through to the 3rd January. If your plans change and you need to get your CLs earlier for some reason, give me a call on 07971 019228 and I can get them for you and you can pick them up from my house in Benenden.